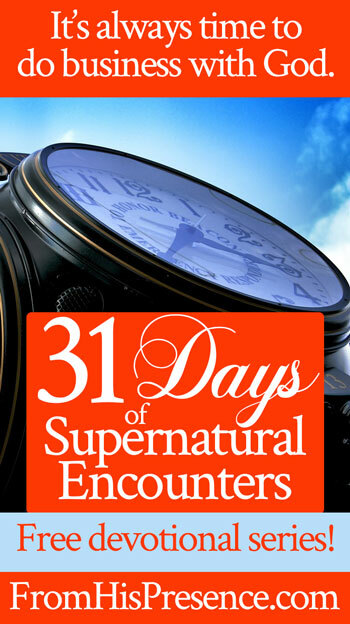 For Day 23 of our 31 days of supernatural encounters (series index here), we are practicing feeling the Father in your heart. A lot of people will tell you that Jesus is in Heaven; that Father is in Heaven; and that Holy Spirit is the only One of the Godhead who is here on earth with you. Personally, I hate that line of thinking. Not only is it formed out of a lack-based, orphan-spirit mentality, but, fortunately for us, it’s not even true. It’s not Biblical at all. An enemy has done this. An enemy has sown this lie into religious culture and mindsets. And if we’re going to live in intimate relationship with the Father, we need to use God’s Word to discover the truth and root out the lie! 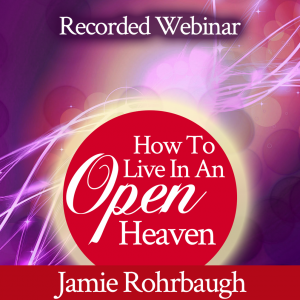 If Papa God is in Heaven and not on earth–not in your heart–then He feels far removed from your ordinary life. Right? And that’s exactly what the enemy, the original orphan, wants you to think. The enemy wants you to think that Father is distant, cold, and inaccessible. He wants you to feel separated from Papa God. But JESUS said that Father IS actually in you–and that He, Jesus, is too. But then, as soon as they get old enough to “understand” more, people rush to tell them the opposite. They tell those same children that Jesus really isn’t in your heart; it’s Holy Spirit in your heart, and Jesus is in Heaven with Father. But Jesus said that He IS in you, and that Father is in you too. So if you follow what Jesus is saying logically, you see Jesus inside the Father and the Father inside Jesus (statement 1). Then, in statement 2, you see Jesus inside Father, and YOU are inside Jesus. That means that wherever Jesus is, YOU ARE TOO. So since Jesus is in the Father, you are in the Father too. Are you with me so far? Since Jesus is also inside YOU, and Father is inside Jesus, then FATHER is inside you too. It works both ways. Where Jesus is, you are; therefore, you are in the Father. And where Jesus is, Father is; therefore, Father is inside you too. You and Father are in each other because you are in Christ. That will blow your mind if you take time to think about it. Look down at your body right now. Jesus said He is IN you. So He’s living inside you right now. Yes, Jesus is. Pat your tummy. Touch your arms. Jesus is not only with you, but He’s actually inside you. He’s IN you. Now do it again–and know that Father is in there too. Yes, Father God, your Papa, your Heavenly Daddy, is right inside you right now. You just touched your Father. He’s not a distant Father. You are not alone. Jesus has not left you comfortless. Instead, Jesus said He is in you; and Father is in Him, and so Father is in you. Father God Himself is in you right now. It’s not true what “people” say about Father and Jesus being in Heaven, with Holy Spirit being the only God on earth. It’s not true at all. That’s not what Jesus said. JESUS said the opposite, and I’m going with what Jesus said. then we can live in the intimacy with Father God that He designed for us. Then we can sense the presence of the Father inside us. Then we can touch the Father, for He’s right inside you. Then we can know Him as the close, loving Father that He is, for a loving Father would never leave us nor forsake us. Spend time right now sensing His presence. Look down at your body and know that He’s in there. Focus in on Him. Let it blow you away that Father God, who also is sitting on the throne in Heaven right now, is somehow, also, right inside YOU. Thank You, Father. And thank You, Jesus, for making a way for Father to live inside us. “Heavenly Father, I come before You in Jesus’ name. Abba, Father, Daddy, Papa … I love You. I’ve been longing for You for such a long time. Longing to see You; longing to rest in Your arms; longing for the safety of Your embrace. And Father, now I see that I don’t have to miss You anymore. You are within me. You are here with me right now, living in me; and I am already in Your arms. Thank You, Papa. Thank You for being with me and in me. I love You. Please help me sense You more each day, and commune with You, and become closer and closer to You each day. Listen to Housefires sing “Good Good Father,” and focus your attention on Father inside you. Talk to Him, knowing that He’s right there with you, inside you right now. Let Him love on you and minister to your heart with His love and His presence. Have you been feeling dead inside? Does this word encourage your heart today? If so, please leave a comment below. I’d love to hear from you! Thank you and blessings for such a beautiful truth, precisely I was calling His Name Father Father speak to me my Father where else I can go but to you, since I can’t sleep thinking of Him, I peak up my phone and WOW!! You send this word, I know this word us for me, thank you thank you thank you, blessings blessings of peace and of perfect love from our Father, in Yeshua s Mighty Name, much love you my sister Jamie ??? 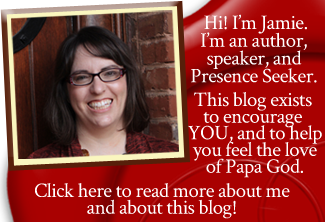 Daddy is a good …good Father and being reminded of his closeness is exactly what I needed to hear! Thank You for this word today. I look forward to seeing your posts each day and receiving God’s Word sent through you. Thank you, this word healed me of deep, deep hurt. It exposed the lie and revealed the truth. Thank you! I use to be careful about telling Father or Jesus I loved them because I knew that to love them meant to obey Jesus, but I was convinced that unless I obeyed perfectly everything then I wasn’t obedienent. That was the lie, I do obey Jesus, it may not be perfect but my heart is to, and I’m in the process and I do obey his teaching, the ones I can at the moment. When he revealed that to me, chains of imprisonment fell off me and I am free to declare and receive my love for him and his love for me. I praise God through My Lord Jesus, for you Jamie. Another beautiful perfect message in a perfect time. My longsuffering and adoration belongs to Him. In all I am and all I do, He is with me, and this makes each day, season, breath easier. For it is only Papa Father who provides for me daily. Who speaks to me daily. Who loves me daily. He’s a good good Father and He never leaves or forsakes me. Prayers your moment of illness had dissipated and your energy is restored. I never thought of it quite that way, it is a new perspective, Jesus and the Father are one.